Despite fears that North Pole voyages will no longer operate after this year, Poseidon Expeditions has announced three departures in 2016. The 14-day polar expeditions will be aboard the 128-passenger, nuclear-powered icebreaker named 50 Years of Victory. The voyages to 90º North — the geographic North Pole — take place at the height of the summer season: July 10, July 21 and Aug. 1, 2016. The programs also include Franz Josef Land, an infrequently visited region in the Russian High Arctic. Rates range from $26,995 per person for a standard stateroom to $41,995 for the Arktika Suite. In early 2014, it was feared that North Pole expeditions would end this year after the 50 Years of Victory stopped operating passenger voyages in favor of more lucrative work clearing the way for cargo and scientific ships in Arctic waters. But in October, Poseidon announced that the owner of the icebreaker, Atomflot, decided once again to operate passenger voyages through 2018. The company said it was “happy” to resume the North Pole program. For a taste of the reaction, check out this lip dub video produced last August during the final North Pole cruise of 2014. Since 2001, Poseidon has operated 29 voyages carrying more than 2,750 passengers to the North Pole aboard the 50 Years of Victory and the nuclear-powered Yamal. In addition to the newly announced voyages, limited space is still available on this year’s departures on July 19, July 30 and Aug. 10. Per person rates start at $25,995 for the 2015 season. The North Pole adventures begin and end with overnight stays at a deluxe hotel in Helsinki, Finland. Charter round-trip flights then take the travelers to Murmansk — headquarters for the Russian icebreaker fleet — to board the ship. All departures feature presentations by the expedition staff, excursions onto the sea ice and ashore via Zodiac landing craft in Franz Josef Land, helicopter flightseeing, and other activities. First and foremost a working vessel, the 525-foot 50 Years of Victory still accommodates guests in comfortable staterooms with private facilities and exterior views. Public spaces include a dining room, an aft salon, a bow-facing bar and lounge, library and lounge, and a gym, two saunas and swimming pool with heated seawater. The ship has a clinic and physician. 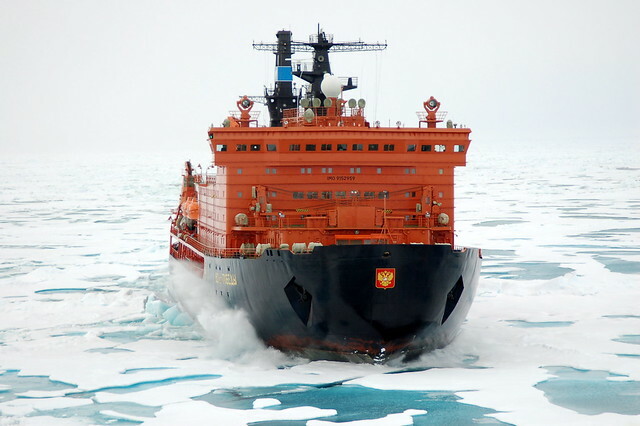 “The beneficiaries are the many intrepid travelers who haven’t yet had the opportunity to stand on Arctic Ocean sea ice at the literal top of the world, to explore Franz Josef Land and to experience traveling aboard an incredibly powerful ship that can crush ice up to three meters thick,” Saveliev said.